The “lens” is actually a massive cluster of galaxies known as Abell 2744. As predicted by Einstein’s Theory of General Relativity, the mass of the cluster warps the fabric of space around it. Starlight passing by is bent and magnified, much like an ordinary lens except on a vastly larger scale. The Hubble Space Telescope, along with the Spitzer Space Telescope and the Chandra X-ray Observatory, has been looking through this gravitational lens at the Abell 2744 cluster, which is approximately 4 billion light-years away. The Hubble exposure of Abell2744 revealed almost 3,000 distant galaxies magnified as much as 10 to 20 times larger than they would normally appear. Without the boost of gravitational lensing, almost all of those background galaxies would be invisible. Among the results was the discovery of one of the most distant galaxies ever seen — a star system 30 times smaller yet 10 times more active than our own Milky Way, and giving astronomers a rare glimpse of a galaxy born not long after the Big Bang itself. Frontier Fields is currently targeting a total of six galaxy clusters as gravitational lenses. More than 400 years ago, Galileo turned a primitive spyglass toward the sky, and in just a few nights learned more about the unseen heavens than all of the scientists and philosophers before him, combined. Since then astronomers have been guided by a simple imperative: Make Bigger Telescopes. As the 21st century unfolds, the power of optics has grown a million-fold. Telescopes cap the highest mountains, sprawl across deserts, fill valleys and even fly through space. These modern giants provide crystal-clear views of stars and galaxies billions of light years farther away than anything Galileo ever saw, each breakthrough in size bringing a new and deeper understanding of the cosmos. It makes you wonder, how big can a telescope get? 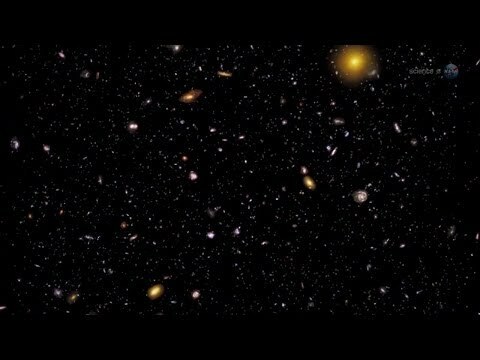 Would you believe, bigger than an entire galaxy? At the January 2014 meeting of the American Astronomical Society, researchers revealed a patch of sky seen through a lens more than 500,000 light years wide. The answer seems to be “yes.” At the AAS meeting, an international team led by astronomers from the Instituto de Astrofísica de Canarias and La Laguna University discussed Hubble and Spitzer observations of the Abell 2744 cluster. Among the results was the discovery of one of the most distant galaxies ever seen — a star system 30 times smaller yet 10 times more active than our own Milky Way. Bursting with newborn stars, the firebrand is giving astronomers a rare glimpse of a galaxy born not long after the Big Bang itself. Overall, the Hubble exposure of Abell2744 revealed almost 3,000 distant galaxies magnified as much as 10 to 20 times larger than they would normally appear. Without the boost of gravitational lensing, almost all of those background galaxies would be invisible. Abell 2744 is just the beginning. Frontier Fields is targeting six galaxy clusters as gravitational lenses. Together, they form an array of mighty telescopes capable of probing the heavens as never before.